The Right Way to Delegate (Part 1) - Organising Works! 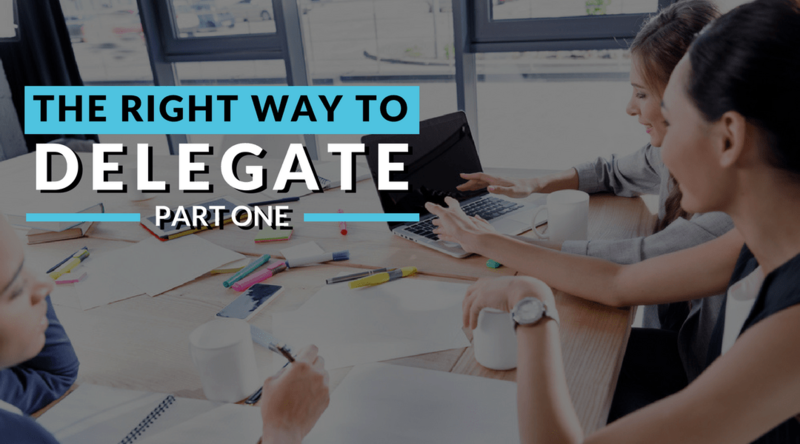 As a Business Owner, Leader, Entrepreneur or Manager, you must be able to effectively delegate. You just can’t grow a business doing everything yourself. Delegation is about giving responsibility and authority to a team member to complete a task. Delegation frees you up to focus on growing the business and the crucial strategic work that only you can do. Delegation frees you up to focus on growing the business. Delegation and Systemisation go hand in hand. First, you systemise the process; then you get someone else to follow the process. Once a task has been systemised, the outcome is predictable, and the process of completing the work should be straightforward if the documentation of your system has been tested and implemented correctly. To get past the “job” stage of your business into the growth stage, you must delegate all the other stuff. Until you empower others to take all that other stuff off your plate, you can’t focus on the highest payoff activities. Initially delegating tasks will free up head space, it will possibly allow you to take on more clients or sell more products, however, you won’t free yourself entirely from your business and have the business run without you until you delegate the doing part and the selling. We’ll get deeper into this in part 2 of this article. Often in the excitement of offloading a task you no longer want to be doing, it’s easy to fall into the trap of abdication rather than delegating. What is the difference? Well, when you abdicate a task or role, you are abandoning all responsibility. A task is simply handed over to a team member, and they are expected to know how to do it. Problems arise when you hand off a task and completely remove yourself from the picture. Even with documented systems and step by step instructions in place, leaving staff to just get on with it can lead to more work for you not less. A task may get completed, but has it been completed to the standard required, and have mistakes been picked up? More seriously money and assets have been known to go missing when the business owner is not keeping an eye on the books and entrusts all is well. As the business owner, you are ultimately accountable. Problems arise when you hand off a task and completely remove yourself from the picture. When tasks are abdicated, ultimately things go wrong, and you as the business owner have to step in to fix up all the problems. Out of frustration, you take on the task yourself, and this is when the mindset of “nobody can do it as well as me” sets in. To avoid this scenario, the answer is not to keep on doing everything yourself or micromanaging; the solution is delegating the right way. Will employees still make mistakes when I delegate properly? Yes possibly, but they are not left to struggle and repeat the mistakes. Delegation only works when the person who is delegating keeps control of the situation, but not the work. Be specific about task, job or role you delegate. For example: Instead of “Answer The Phone”, try “Answer the phone within three rings following the How to Answer a Call process”. How do you know if the task was done to the standard required? The standard needs to be clearly communicated. For example – All incoming help desk inquiries but be initially responded to within 2 hours. Issues must be resolved within 24 hours, and if this is not possible, the issue must be escalated. The person/s that you are delegating to first need to understand what they are being asked to do and then to agree to what is being delegated and the measurement. Be prepared to train them and clarify where necessary. Is this something that can be done with the available resources, within the expected time frame and with the skills and experience of those you are entrusting with the task? Provide a specific time period in which to accomplish the task. Repetitive tasks can usually be defined by time; other tasks may require an estimate of time. For more prolonged tasks with multiple parts such as projects, set up milestone timelines. For example – Payroll is done on a Tuesday afternoon between 3 and 4 pm; this task should take no longer than 1 hour. Over time, your team develops a clear picture of what is to be done, how it should be done as well as the understanding of the importance of the task. They have confidence in performing the role and know that if they make a mistake, they have the skills to fix it. Strong leaders set performance measurements and have regular performance reviews with their team; each team member knows precisely how they are performing in their role and what if any performance improvements need to be implemented. Letting go of tasks you have always done can feel daunting and that you are losing control especially if you have a particular way of doing them. Once you have had success delegating one task, then move through your list of tasks you have listed for delegation. Identify the tasks that you want to delegate. Specify the expected outcome of the delegated task. Give information on what, why, when, who, where and how. Demonstrate how the task is to be performed or how to run the system. Get the person to run the task while being supervised. Communicate and guide as appropriate. Once the person feels comfortable, allow them to work on their own initiative, don’t micromanage. Remember not to abdicate total responsibility, still monitor progress and obtain feedback. In part 2, we will look at the type of tasks that you can delegate and what you can do to reach the point when your business can run without you.